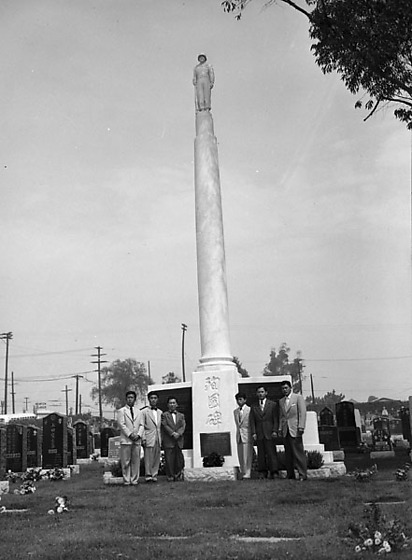 Six veterans of the 100th Infantry Battalion from Hawaii paying respects at World War II Nisei memorial at Evergreen Cemetery in Boyle Heights, Los Angeles, California, September 3, 1950. Monument is dominated by a statue of a soldier, Sadao Munemori, standing atop a tall white column flanked by plaques with quotes and dedication. Veterans are dressed in suits and lay flowers on graves. The men are identified (97.267.57_4) Henry Nakamura, Henry Oyesato, Ken Okamoto, John Ushijima, Akira "Sunshine" Fukunaga, and George Miki. Typed on original negative envelope: Veterans of 100th Battalion Paying Respect at Evergreen Cemetery.